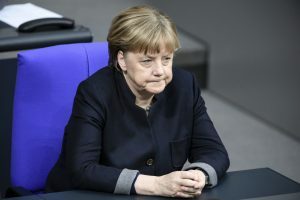 Today at the Worldwide Headquarters of Manhattan Infidel™ I have the pleasure of interviewing someone who has long been a leader, indeed some would argue THE leader on the world stage, Germany’s very own Angela Merkel. MI: Good afternoon Chancellor Merkel. AM: Good afternoon Manhattan Infidel. MI: You were recently quoted as saying that all European nations must compromise and give up their sovereignty to Brussels in order to establish a pan-European state. AM: Yes. This is true. All the smaller, less-powerful nations in Europe must give up their sovereignty to Brussels and the European Union. And by Brussels and the European Union I of course mean Germany. MI: Germany historically does have a habit of asking smaller nations to give up their sovereignty. And by asking I mean invading. AM: It’s for their own good! AM: Yes. Under the benevolent gaze of the fatherland all of Europe will be united in peace and harmony. MI: All of Europe. Even France? AM: France has always been our friend and ally. MI: What about the Franco-Prussian war? AM: Kicked their little French asses to the curb. MI: World War I? World War II? AM: I don’t wish to discuss those. MI: Why not? Why don’t you want to discuss those wars. AM: SHUT THE HELL UP. JUST SHUT THE HELL UP ABOUT THOSE WARS! MI: Wow. You seem quite angry and bitter. AM: You would be too if you started two neat world wars and neither one panned out as you wanted. MI: Neither one panned out? AM: That’s why we came up with the European Union scam. It’s just a way for us to dominate Europe without having to go to the trouble and expense of bombing, invading and killing the smaller countries. MI: I guess that makes sense. What about Great Britain? With Brexit will they be a part of the peaceful Pax Germanica on the European continent? AM: The British? Damn warm-beer swilling, gap-toothed pansies. Let them go. We still haven’t forgiven them for sinking the Bismarck. You’re American, are you not? AM: We shot down Glenn Miller. That was fun. AM: Ve hav ways of making your give up your sovereignty. MI: I had better be going. AM: Hey American. Why doesn’t Donald Trump return my phone calls? MI: I, I don’t know. AM: Oh god I love him so! I love him and I am ashamed. MI: I’ll just be going now. AM: Tell him that I, Angela Merkel, keep a photo of him by my bed. I love him! Oh god I love him so! Please tell him to call me! And so ended my interview with the leader of Europe, indeed some say the leader of the entire free world. I make up. You decide. That’s my motto. Germans are one of tourism’s more enjoyable aspects. There you are on the playa, somewhere nice, surrounded by hemp toting Tuetons. One simple bark, “Jawhol!” and watch them stand to attention! Off you go, gentlemen, Ostfront. That state of mind, lingering as it is, might give AM’s immigrants pause. It does me. Ve have vays of making you emigrate.